Q: Hello, I have to say that in playing around with it it looks really great, but I actually had a question for you. Will this tool generate the necessary code for an e-mail submission when completed? I ask because this would be really huge and probably make it my new favorite tool. Hopefully this would work in a way that would work on Windows hosting as well as Linux? I am required to have Windows hosting for other things but would love to be able to use your tool to create my html form get. So, I guess my question is, is this all planned for the release of this product and will future Beta releases include these sort of features? 1. Use "Preview and test" button. Your form will be saved and processed on our server. Backend on formoid.net will make validation of submitted information and send it at email address that you specified in application. 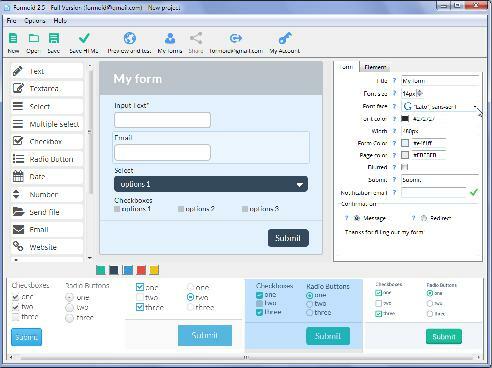 Your form will be saved into our database and you'll able to see it using "My forms" button in application window. Notice that forms generated with Free version are accessible for you only and will be wiped out in 4 hours. With Commercial license, the uploaded forms are accessible for everyone and can be shared or embedded on any website. Click "Share" button and you'll find the code that allows you to insert a form into iframe, pop-up lightbox or open it in a new window. You can use the link from the "Permanent URL" field to call your form by clicking on the button, a menu item or a text link ( tag). 2. Use your own server and our server-side PHP code (backend). You form will be saved and processed on your server in this case. Our backend make validation of submitted information and send it at email address that you specified in application. If you want to use this method, click "Save HTML" button to export your form on a local drive. 2.1. Upload "index_files" folder generated with Formoid app. on your php server. 2.2. Use link to index.php file (generated with Formoid) as link to your form. You can add this link to the button/menu item on your webpage or iframe. - select 'view source' of the page. Notice: if you want to use this method, your server should support PHP. 3. If you server doesn't support PHP, you can use Formoid app. to design the form appearance only. You should write a server-side script by yourself. Use generated index.html file in this case.